Skyscraper construction and design involves creating secure and habitable tall buildings. The buildings must be able to support their weight, and be earthquake, wind and fire resistant. At the same time they must be accessible and comfortable. Skyscraper construction and design poses some complex challenges that must balance construction management, engineering, and financial considerations. 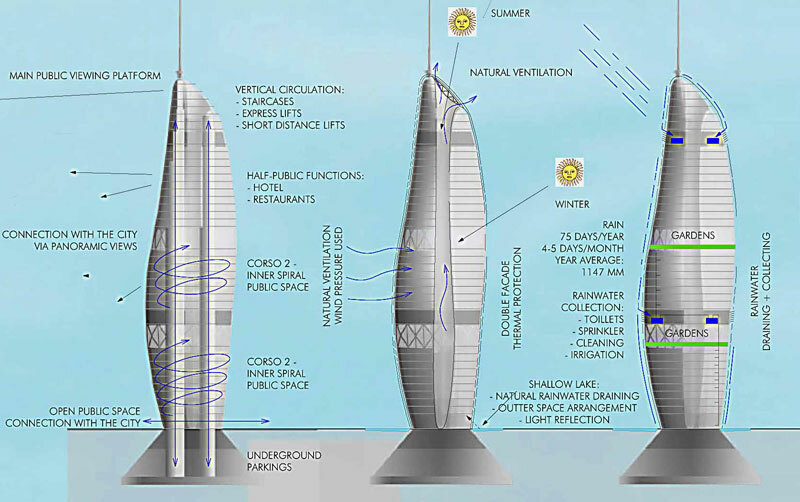 A sound structural design is of the utmost importance when it comes to skyscraper design, given how large these buildings are and how many people will be occupied in them. Extensive wind tunnel and other tests are done to help minimize structural failures and other possible catastrophes. Wind loading is a significant factor in a skyscraper as wind pressure does increase with height. Wind loads on very tall buildings and structures are a major factor in their structural design. The taller and larger a building is, the larger the supporting structural system needs to be. However, because skyscrapers often seeks to maximize floor space, shear walls are usually used in conjunction with other types of support systems. A steel frame is often used, with vertical and horizontal supports, helping to eliminate parts of a shear wall. Reinforced concrete is an important material used in skyscrapers. To maximize the use of steel and concrete together in skyscraper construction, they are often used together. Support columns are made by pouring concrete around steel beams (called rebar). The resulting reinforced concrete compound provides resistance against compression and tension. The cladding on the exterior walls can be made of a variety materials including glass, metal (stainless steel, aluminum) or masonry materials (marble, limestone, granite). Elevators were a necessary precondition for skyscrapers as it was impractical for people to be expected or able to climb many flights of stairs. The elevators are not only a convenience but also part of the structure’s design. Elevator shafts take up a lot of space and engineers must balance the need for transportation with using the building’s space efficiently. Each design for a skyscraper is unique. There are major structural components that can be used either by themselves or in conjunction, including using a steel skeleton that is behind a non-load bearing curtain wall, reinforced concrete skeletons filled in with cladding panels for forming exterior walls, and a center concrete core big enough to contain the mechanical components and elevator shafts, along with various support columns that are place along the building’s perimeter and connected by horizontal beams. Because each skyscraper design is unique, the design models are tested extensively in laboratories or in scaled models. Although the construction process is unique for each skyscraper, here is the general construction process that is followed. A clear piece of land with stable ground and a good location is found. A hole is dug to bedrock level to support the building; this could be up to 200-plus feet deep. The footings (which are like big pads that spread out the weight) are placed at the bottom of the hole. The footings must be placed on stable ground, which is often bedrock. Concrete is poured over the footings. The vertical support beams are constructed and placed using large cranes. These are used to support the vertical load. The horizontal steel girders are then placed between the vertical beams. These are used to bind the building together. The outside walls, which act like curtains, are then placed and the building is finished off.